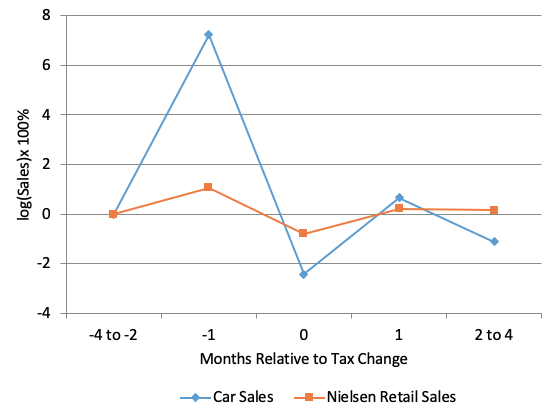 Similarly, recessions seem to affect the attention we pay to news about sales tax rate changes. Building on prior work by Baker et al. (2018), we show that Google searches containing the term 'sales tax' increase substantially in the month before, and month of, a tax change, and this change is particularly large during recessions. News coverage also increases before a tax change, but there is no differential increase in coverage during recessions. Baker, S R, S Johnson, and L Kueng (2018), “Shopping for Lower Sales Tax Rates”, NBER working paper 23665. Berger, D, and J Vavra (2015), “Consumption Dynamics during Recessions”, Econometrica 83(1): 101-154. Chetty, R, A Looney, and K Kroft (2009), “Salience and Taxation: Theory and Evidence”, American Economic Review 99(4): 1145-1177. Correia, I, E Farhi, J P Nicolini, and P Teles (2013), “Unconventional Fiscal Policy at the Zero Bound”, American Economic Review 103(4): 1172-1211. Feldstein, M (2002), “The Role for Discretionary Fiscal Policy in a Low Interest Rate Environment”, NBER working paper 9203. Hall, R E (2011), “The Long Slump”, American Economic Review 101(2): 431-69.